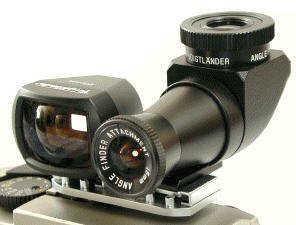 This is the ONLY modern rangefinder viewfinder designed for low angle viewing! These are now discontinued, sold out at the factory, and are very very very hard to come by. 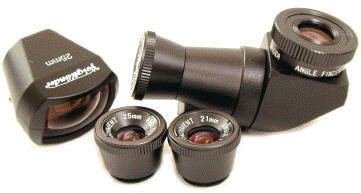 The Low Angle Finder is the first of its kind in 35mm Rangefinder history. 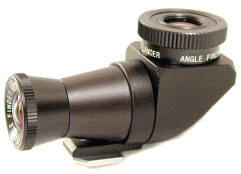 It allows either low angle horizontal sighting of super wides, has interchangeable lenses for 15mm, 21mm, and 25mm lenses, AND rotates for low level verticals ! While made for the Bessa, it should be adaptable to practically any 35mm rangefinder camera, even those coming from Germany with a name starting with L and ending in A !! Once again, Voigtlander has beat Leica at its own game, introducing an innovative product that Leica should have made decades ago. Cosina's innovation continues to amaze me. 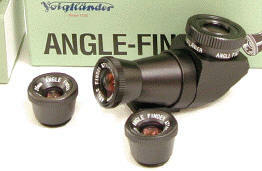 This is a new product, the likes of which no other rangefinder manufacturer has EVER produced. In essence, it's a waist level finder for low level rangefinder shots, with attachments for the 15mm, 21mm, and 25mm lenses. 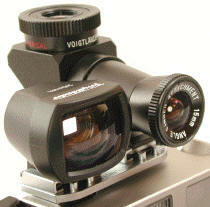 The rear eyepiece has a built in diopter for clear viewing, and ROTATES for even more versatility. The view is NOT reversed left to right. It's a VERY bright clear view, without brightline, with parallax compensation marks. Amazingly, either way you turn the finder to the right or left, the parallax compensation marks flip to the proper orientation. With a dual setup like the one shown above, you can either have each finder for the same focal length, or have them different focal lengths, to switch back and forth between lenses without having to change finders each time. Yikes, talk about a multi-use finder ! Swung to the side as on the far left, your body can face one direction while you take a photograph in another direction -- it's also good to use around corners in the proverbial fire fight documentary. With the finder swung upward, you can get either VERY low angles like you never got before with composed rangefinder shots, or turn it over your head to get a little bit higher than the crown. 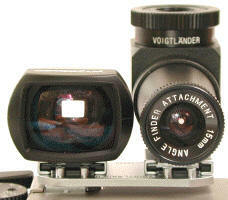 With the finder swung to the side and the camera vertical, you get low angle verticals or above the crowd verticals ! Bottom Line ? if you are a serious rangefinder photog, you owe it to yourself to get the low angle finder, providing you shoot the wide angle lenses it is designed for. You will find yourself getting new shots that before were difficult if not impossible. Some will complain about the cost, but look again. 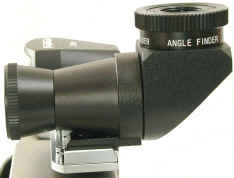 You can get the angle finder and all three attachments for about the same price as a single wide angle Leica finder, or three separate focal length Voigtlander finders.